In the tradition of Sly and Robbie, Wayne “Unga Barunga” Thompson and Jason “Big Bass” Welsh is a Jamaican rhythm section and production duo with their sights set on making a worldwide impact. Their label, Notis (formerly known as Notice), has worked with established Jamaican artists like Konshens, Bugle, and Jesse Royal, winning over reggae fans from all over the world with their 2014 hit single, Diamond Sox by Iba Mahr. For their latest project, an EP entitled New Era Frequency, Unga Barunga and Big Bass collaborated with Nattali Rize, a founding member of the Australian roots band, Blue King Brown. A talented song-writer and vocalist, Rize has always maintained a level of social consciousness in her music, making her well-suited to the reggae genre. New Era Frequency is a fine showcase of her cultural aptitude, boasting six big, conscious tunes along with three accompanying dub versions. Featured Jamaican deejays, Zuggu Dan, and the immensely popular roots revivalist, Kabaka Pyramid, add even more credibility to the project. But Rize, who sounds comfortable singing in a Jamaican patois, does not necessarily need anyone else’s talent or reputation to prove she is the real thing. Her music speaks for itself. 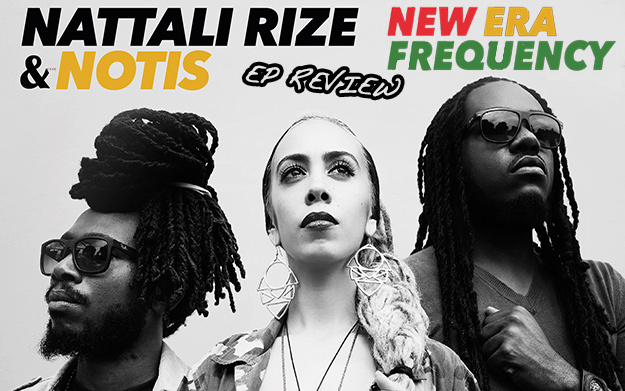 Nattali Rize adapts several reggae styles on New Era Frequency, even employing a more than competent singjay approach on a few tracks. This method is most prominent on Heart of A Lion, which, along with New Reality, features a modern dancehall-style riddim. Other tunes on the EP update vintage roots reggae styles, putting a modern twist on established paradigms. For instance, Mountain has a heavily dub and steppaz influenced feel, and Midnight Remedy and Rebel Love are reminiscent of two different vibes, both of which are distinctly 1980’s reggae. Generations Will Rize, the tune that features Kabaka Pyramid, is the opening track and the only riddim on the record that has a purely modern, Jamaican one drop sound. With six songs, New Era Frequency is of average length for an extended play, but there is also an added bonus of dub versions of Mountain, Midnight Remedy, and Rebel Love. These tracks are autonomous musical works in themselves, and in no way should be dismissed as merely instrumental versions. Counting the dubs brings the total track count to nine, enough music for most people to consider this record to be a full-length album. So, New Era Frequency certainly gives its listeners more than expected, in terms of both quantity and content. Nattali Rize & Notis are a rather fitting team, since both are obviously musicians on their way to worldwide prominence, and possibly even success in pop markets. Rize’s vocals, which are somewhat reminiscent of Rhianna, have real potential to influence pop radio in the U.S., Canada, and Europe, and Notis’ musical prowess and willingness to reach outside of the reggae genre will likely benefit them in more broadly recognized ways in the future. Although there does not appear to be a track from New Era Frequency that is likely to invade mainstream airwaves, or even the local dancehall right now, it is probable that we will see more interesting projects like this from Notis, as well as the singles and riddims that have earned them respect from reggae fans in recent years. And fans of the genre should also keep an eye on Nattali Rize, who could very well become a sought after singer for riddim projects and a staple artist in the dance. Both acts, and certainly Nattali, are indeed on the rise.